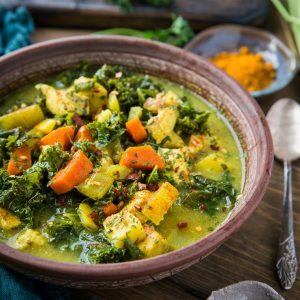 This turmeric chicken soup includes carrots, parsnips, kale, bone broth, and more for an immunity-boosting powerhouse meal. 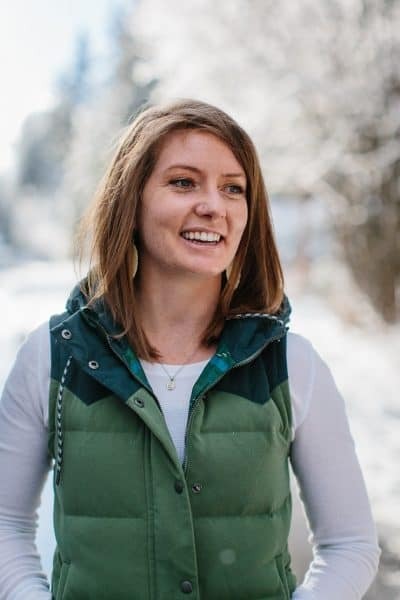 It’s super quick and easy to make and is paleo, keto, AIP, and whole30. Is there anything more gratifying than a big bowl of chicken soup? Truthfully, I don’t discriminate when it comes to chicken soup genre – I’ll eat it all (so long as it’s noodless…read: gluten-free)! Pho, ramen, classic Chicken and Rice Soup, Thai Chicken Soup, White Chicken Chili …You name it, I’m ON it! I find the whole process of preparing a big batch of chicken soup and enjoying it for days on end to be incredibly therapeutic. The scents, the familiarity, the belly-feel…it’s all so pleasant and uncomplicated. If you’re like me and you enjoy a big bowl of chicken soup during those chilly fall and winter evenings, you’re going to go BONKERS over this recipe. 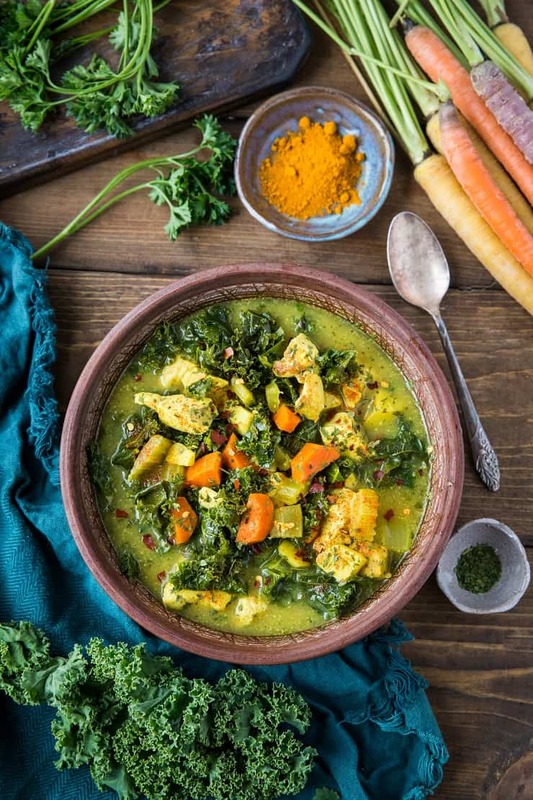 The basic premise is this is a classic chicken soup with the added pizzaz of turmeric, ginger, parsley, and kale for a nice antioxidant punch, giving you even more nutrients and flavor. 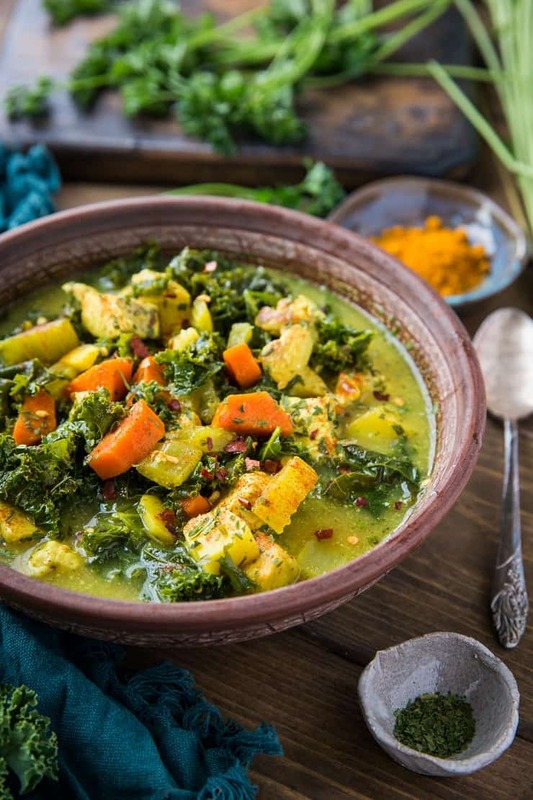 In addition, I add coconut milk to balance out the sting of the turmeric and ginger so you’re left with a beautifully flavored, oh-so satisfying bowl of yummy superfood. 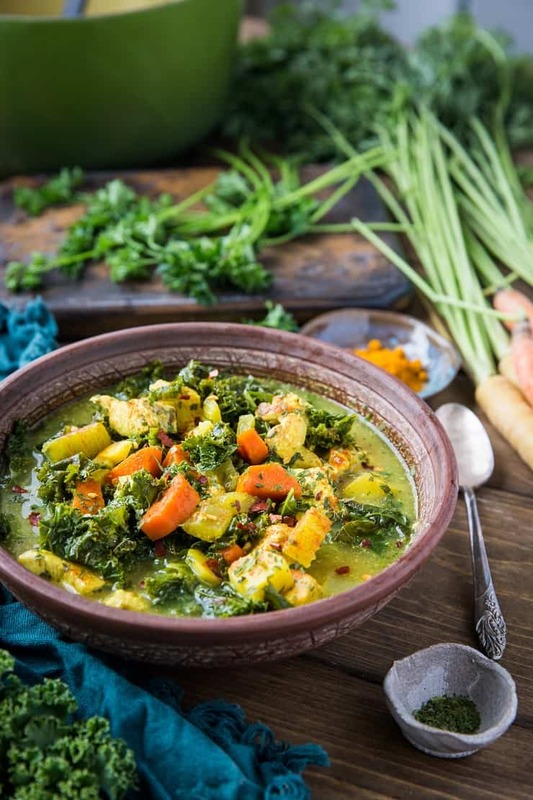 This is a powerfully healing recipe for both preventing and getting rid of colds. 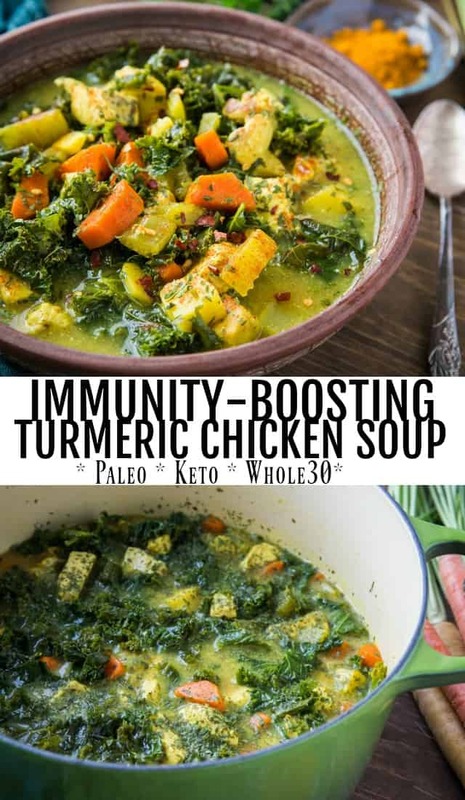 Since cold and flu season is upon us, you’ll want to keep this one in your arsenal to stay on top of your immunity game, and to whip up when someone in your house gets sick. In case you’re new to turmeric, I’ll give you a brief run-down about why it’s so cool. Packed with antioxidants, which helps eliminate free-radicals, thereby preventing disease, slowing down the aging process, and fighting cancer. Boosts levels of your brain hormone, BDNF, which can help reverse and prevent brain-related illnesses like Alzheimer’s and depression. May lower your risk of heart disease by improving the function of the endothelium (the lining of your blood vessels). I will say, you can absolutely over-do it on turmeric, so be careful not to get too excited and add too much. I find 1 teaspoon is the perfect amount for this soup, where you get a hint of the flavor but it is far from overpowering. If you’re a turmeric-loving badass, you can adjust up if you’d like. One of the best parts about chicken soup is it is incredibly easy to make, and doesn’t require very much hands-on time. Start by sauteeing the vegetables in a large stock pot (I use my French oven). Add the chicken and allow it to brown for a few minutes. Add the spices and stir well. You’ll want to continue sauteeing everything until you can smell the turmeric. Add the bone broth and coconut milk, cover, and cook at a simmer for at least 15 minutes, preferrably 1 hour. 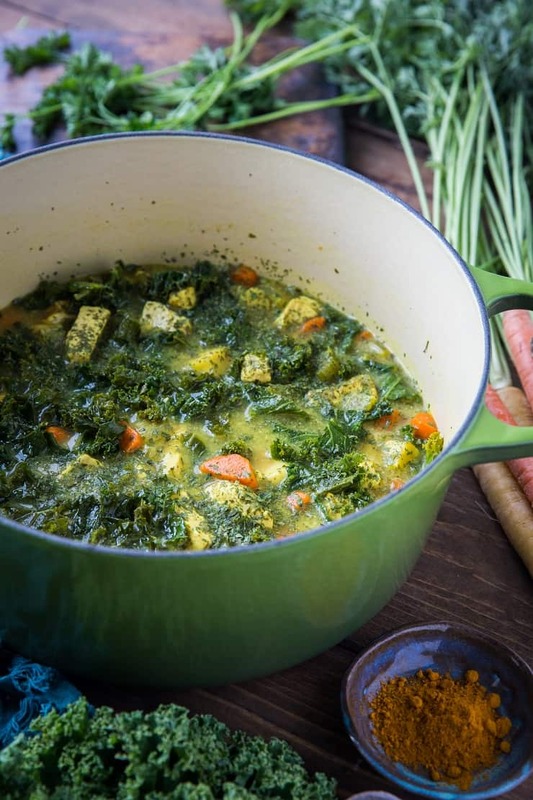 Once the soup is nice and flavorful, add the chopped kale leaves and stir them in. Continue cooking until they are nice and wilted. Serve it up with your choice of crackers, bread, grilled cheese…however you like to eat your soup! To make this recipe Low-FODMAP, omit the onion and garlic – don’t worry, the soup will still be plenty flavorful! If you want to infuse this soup with even more vegetation, consider adding broccoli or cauliflower florets, or even bok choy. Add ⅓ cup rice or quinoa for some grain action. Add 1 yukon gold potato or a small sweet potato for some veggie starch action. I like using bone broth for maximum nutrients, but you can use regular chicken stock or even vegetable broth. I hope you enjoy this colorful display of belly-warming comfort food! Heat the avocado oil in a large stock pot or Dutch oven over medium heat. Add the onion and saute, stirring occasionally, until transluscent, about 5 to 8 minutes. Add the carrots, parsnips, celery, and garlic and continue sauteeing, stirring occasionally, until vegetables are softened but still al dente, about 3 to 5 minutes. Add the chopped chicken and cook just long enough to brown the meat, about 2 to 3 minutes. Add the remaining ingredients, stir well and cover. Cook at a gentle simmer, stirring occasionally, for at least 30 minutes (ideally one hour). Taste soup for flavor and add more sea salt if desired. Serve and enjoy! There is nothing like a big bowl of chicken soup, and I love all of the flavors you’ve packed into this cozy bowl! With cold and flu season ramping up I need all of the immunity boosting I can get. I’m on this! Looks delicious! If you were to make this in an instant pot, how would you modify the recipe? Hi Kelly! I would follow the same instructions (but using the saute function in the Instant Pot), then secure the lid and Pressure Cook for 20 minutes. Hope you enjoy! Made this wonderful soup for dinner last night … it was SO delicious!! Immune-boosting indeed – just perfect!! Thank you for the recipe! made this soup for lunch today and it was awesome. I will be making this again. Look so yummy and healthy. Hope my mom and 6 years old baby girl will love this. Thanks for the amazing recipe. My family does not enjoy coconut milk, any recommended substitute? Milk, cream, Greek yogurt? I would recommend half & half as a replacement 😀 Hope you enjoy! 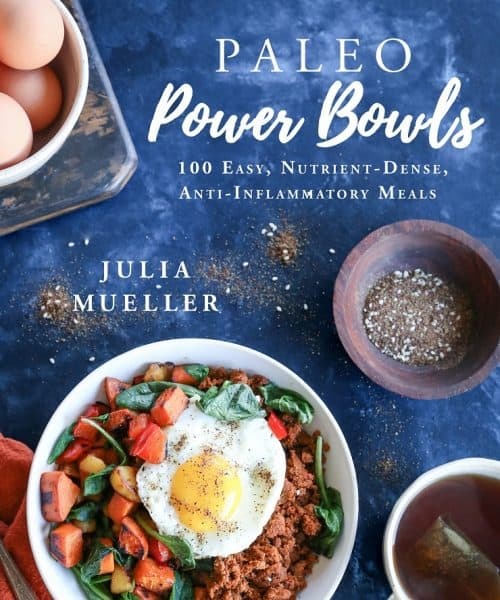 Hi Julia – I love your recipes and your food choices. I am wondering if you ever cook with Jack Fruit? We really like it but I would love to have recipes from you using jack fruit.